A majority of our stock is one of a kind and impossible to get our hands on, but we love the search so some of your most sought after books are attainable! With everything from the 50's funnies, to the newest issue of your favourite comic - we love the hunt, so we're bringing in new stock weekly, and even daily! We've got a little something for all ages. We love to fill your want lists, and will most likely have that last issue you're looking for. We're ever-growing, so check us out! A huge thank you to our customers and their support, they helped get us to where we are today. 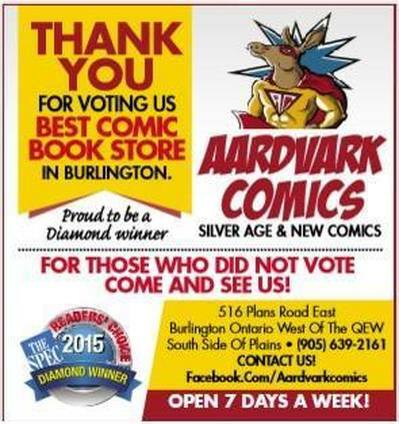 We have been awarded the "Diamond" Award for Comic Book Stores in the Hamilton Spectator's 2015 and 2016 Readers' Choice awards!